We first tried out our dot markers with our dinosaur play dough mats – which handily work well for the markers too! 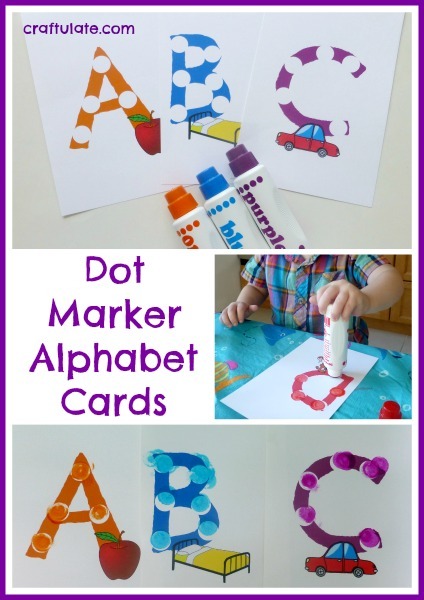 The markers are great for working on fine motor skills when the aim is to place the dot in a specific place. 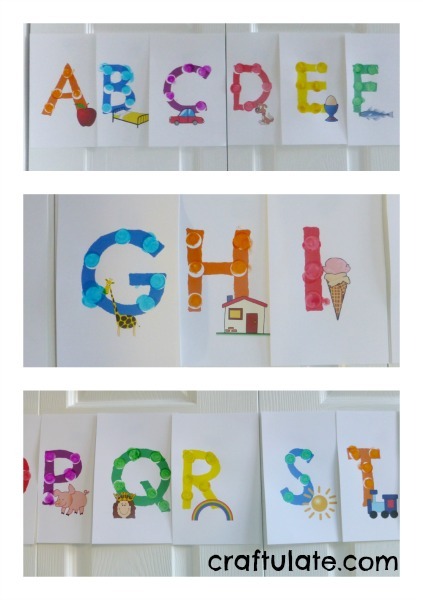 So I designed these alphabet cards for some more practice! I used bright bold images for each letter (agonising over “Q” and “X” as usual – why is there so little choice of familiar words?!?!) and I coloured each letter so that it corresponded to the colours of our dot markers: purple, blue, green, yellow, red and orange. This introduced a colour matching angle to the activity too. I set out the first three cards for F with the correct colors of dot markers. He immediately got started, getting the dot markers on the white circles pretty accurately. After he’d done A, B and C, I just kept supplying him with the cards! He used both hands to make the dots, and although he had an awkward-looking grasp of the marker at times, he had good control. He went all the way through to R before pausing to wind me up by putting the orange lid on the purple marker. He *knows* I can’t deal with that! 🙂 He then continued all the way through to Z. I was really impressed with his concentration and he was so pleased with himself when he’d finished. When they had dried I taped them up onto our kitchen cupboard doors – they only just fit! These cards have stayed up for several weeks now, sparking many alphabet recitals and conversations about the pictures! 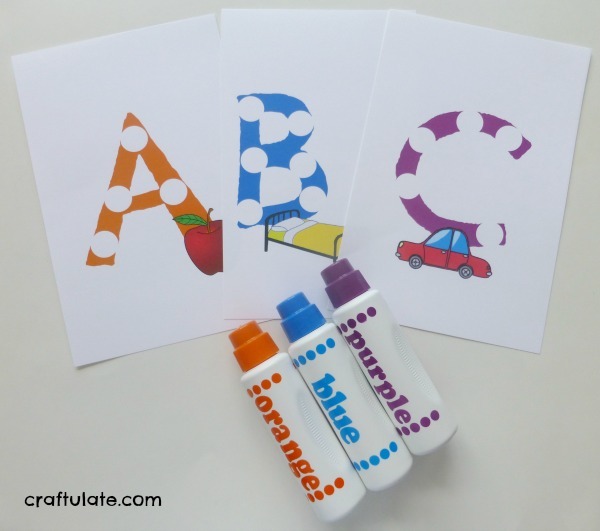 These beautiful dot marker alphabet cards are available in my Craftulate Shop!!! 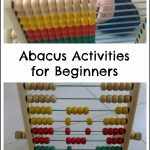 Please check out the rest of the Fine Motor Fridays posts from this week for more great ideas!